Reading, writing, arithmetic ... and climate science. That doesn't have the same ring as the "three Rs" of education, but Connecticut could one day require the subject to be on the curriculum, The Associated Press reported. A Connecticut state lawmaker is pushing a bill to mandate the teaching of climate change in public schools throughout the state, starting in elementary school. On a Monday morning at the end of October, Rob Ross asked a group of Earth scientists and educators a question: How many of them had received copies of the Heartland Institute book Why Scientists Disagree About Global Warming? You could feel an immediate sense of frustration in the air. Roughly half of them raised their hands. The Heartland Institute is a Chicago-based think tank that rejects the scientific consensus that humans are changing the climate and has received funding from the conservative billionaire Koch brothers and fossil fuel industry. Four Democratic senators sent a letter to Education Sec. Betsy DeVos this week calling out her support of President Trump's decision to pull out of Paris. The Heartland Institute is trying to nurture the next generation of climate change deniers. 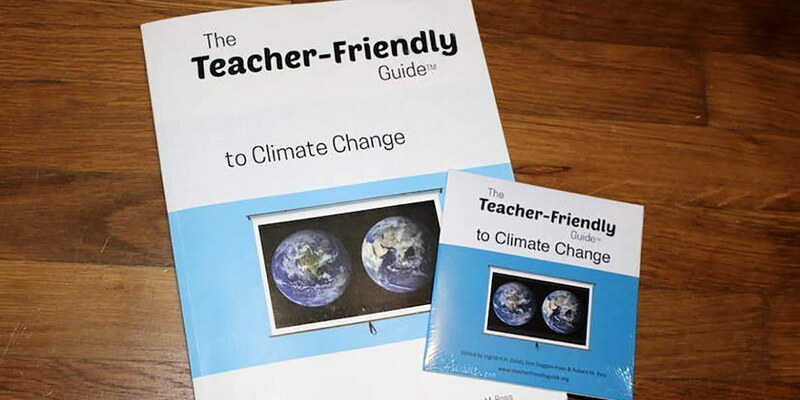 The conservative and libertarian think tank has sent out 25,000 copies of the organization's book, Why Scientists Disagree About Global Warming, and an accompanying 10-minute DVD to 25,000 science teachers this month, according to a Frontline report. The book argues that climate change is not settled science. Tom Harris, who originally trained as a mechanical engineer, has been a strategist for the climate change denial industry for at least a decade. A favourite presenter misrepresented as a PhD at the Heartland Institute’s regular climate change denial conferences, Harris has worked directly for companies like the international PR giant APCO Worldwide and for energy industry lobby firms such as Toronto’s High Park Group. More recently, he has launched or led at least three phony “grassroots organizations”—energy industry front groups that promote confusion or denial in climate science. "We have documented a large number of examples where the science that is taught is at least incomplete if not incorrect. There are a number of examples where Harris cites studies that were later rebutted …, and still more where he appears to have missed key publications … and this may indicate that he is unaware of the current scientific literature and prevailing scientific opinion." Notwithstanding, Harris has proved to be a popular teacher, who readily gives out high marks to the students most willing to parrot the denier line that he and his (often industry-associated) guest lecturers promote. One of the biggest problem that CASS reported in trying to assess the content in Harris’s course is that he generally does not refer to primary sources—to references in peer-reviewed literature against which his contentions can be tested. Instead, he constantly tells students that he has been in personal or email contact with prominent scientists who have given him information—the vast majority of which is dubious, outdated, unsupported by science or simply wrong. The CASS report offers the possibility that Harris is merely incompetent—that he has got the science wrong purely because he is out of his realm of expertise. But the authors also note the coincidence that “all the mistakes (Harris makes) support his thesis of no climate change effects." More likely, it seems, for someone who has made his living dissembling about climate change on behalf of energy industry company-funded front groups, Harris has taken that campaign into the classroom with a disregard for the science and evidence that is somewhere between reckless and irresponsible. There will almost inevitably be an argument about whether someone like Harris deserves protection under the principles of academic freedom—and certainly legitimate academics should be free to pursue their own course of study and to make whatever arguments they can support. The question here is whether an institution such as Carleton can be forgiven for employing an instructor with no relevant credentials and significant and obvious economic conflicts. And, if Carleton is going to wrap Harris in a cloak of academic freedom—if the university is prepared to defend an industry front man’s right to dilute the university’s credibility by promoting views that are demonstrably incorrect and obviously grounded in a corporate agenda to deceive—then that should be a signal to prospective students and parents that they may want to exercise the freedom to choose a real university, one that values the accuracy of its curriculum and the integrity of its (other) faculty. The full report, with references, is available by clicking here. To see a selection of some of the 142 points of disinformation identified in the CASS report and responses to rectify those claims, view Richard Littlemore's entire piece by clicking here. Who's Funding Climate Change Denial? It was not probably the Valentine’s present the leading climate skeptic organization, the Heartland Institute, was expecting. But after years of exploiting ClimateGate and leaks from climate scientists, on Feb. 14 they were on the receiving end of their very own leak. The climate denial watch-dog, DeSmogBlog, has leaked details of Heartland’s strategy and funding documents exposing the heart of the climate denial machine. The documents confirm what many people have suspected for a while—That Heartland not only receives money to fund its own climate skeptic work, but it also funds other leading skeptics, such as Craig Idso, who gets $11,600 per month and Fred Singer who receives $5,000 per month, plus expenses. Heartland is also spending a whopping $388,000 for a team of skeptics to undermine the findings of the UN climate body—the Intergovernmental Panel on Climate Change. One of the documents leaked is Heartland’s Fundraising plan for this year, which exposes some of the world’s best known companies, such as Altria (parent company of Philip Morris) Bayer, Eli Lilly, General Motors, GlaxoSmithKline, Microsoft, Pfizer and Time Warner, as funding the climate denial movement. The Fundraising plan also reveals that the Koch Brothers are once again funding the Institute’s global warming disinformation campaign. Up until Feb. 14 it was thought that the last funding was more than a decade ago. So here is confirmation in writing what many people have known for years—that the Heartland Institute is effectively acting as a front group for big oil and energy, raising money from companies which are threatened by climate policies, so that it can essentially do their dirty work in undermining legislation that threatens their corporate bottom line. And in that sense, the boys from Heartland are guns for hire. And this is where it gets interesting. The documents show that Heartland’s climate change denial machine is chiefly funded by one donor, who is just called “Anonymous." Their identity is not disclosed in the confidential documents. But the accounts reveal that this one donor has donated $13 million to Heartland’s climate denial work over five years, with another $1 million planned this year. For one person to have such a huge influence on a key climate skeptic think tank is both interesting and worrying. For years the climate skeptics have operated to clear double standards. On the one hand they have repeatedly argued that climate scientists must be transparent with their work and have inundated them with Freedom of Information requests, but at the same time they have refused to come clean over who funds them. Surely it is now beholden on the Heartland to come clean and tell everyone who their “key Anonymous Donor” is? In the interests of transparency and credibility, it is the least the Heartland Institute can do.